Daihatsu is No. 1 with German customers -- all 13,726 of them. The Toyota small-car subsidiary passed BMW and Audi to rise from No. 6 last year to the top spot in the 2009 J.D. Power and Associates vehicle ownership satisfaction study in Europe's largest market. It is an impressive accomplishment for a brand with a 0.4 percent share of a 3 million-plus new-car market last year. At first glance, it seems a bit strange to even have a brand like Daihatsu included in the study when the BMW X5 crossover outsold the Japanese automaker's entire lineup by 2,690 units last year in Germany. But it is quite common for niche players to claim the honor: The 2008 and 2007 winner was Honda, which had a 1.3 percent market share in Germany last year. It also is common for Japanese brands to lead the survey as Toyota was No. 1 from 2002-2006. A German brand has never been No. 1 in its home market since the study started eight years ago. Martin Volk, a London-based senior research manager at J.D. Power and Associates, told Automotive News Europe that Daihatsu does an excellent job in two of the four areas that the survey covers: ownership costs and the quality of the service team. He said Daihatsu pulled away from the rest this year by really improving its vehicle quality. "They do a fantastic job with what their customers expect from them," Volk said. Daihatsu finished with a score of 843 on a 1,000-point scale. Mercedes and Alfa Romeo tied for second with 835 points. One message that the J.D. Power study delivers is that it is easier for a German premium brand to disappoint in its home market than it is for a Japanese brand to pleasantly surprise. The other message is that by providing value for money and better-than-expected service, even a tiny niche brand can conquer the giants on their home field. 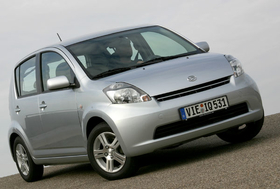 The Daihatsu Sirion is the top small car in Germany based on results from a J.D. Power vehicle satisfaction survery.